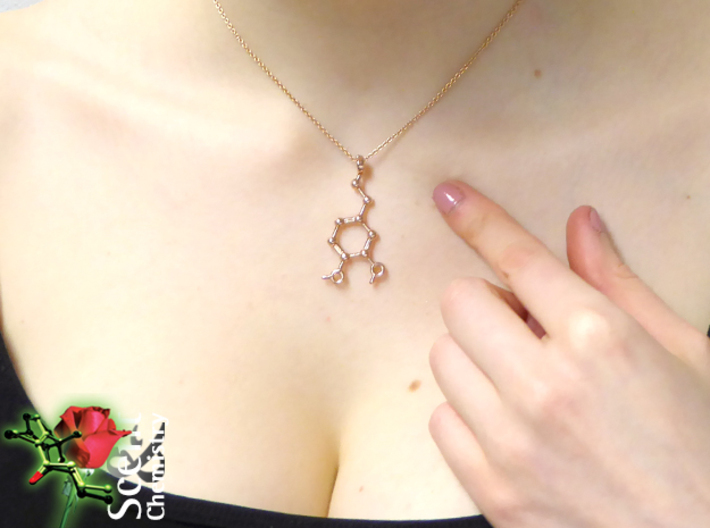 14k Rose-gold plated dopamine pendant on an Oro Vivo 7612690465149 necklace. 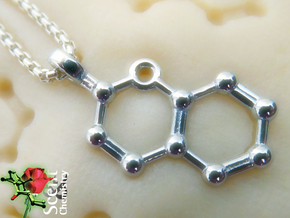 Motivate and stimulate, and make the world fall in love with you: ‘Be Dopalicious’ with a lovely dopamine pendant!! Take a bite out of life and get a dopamine blast! 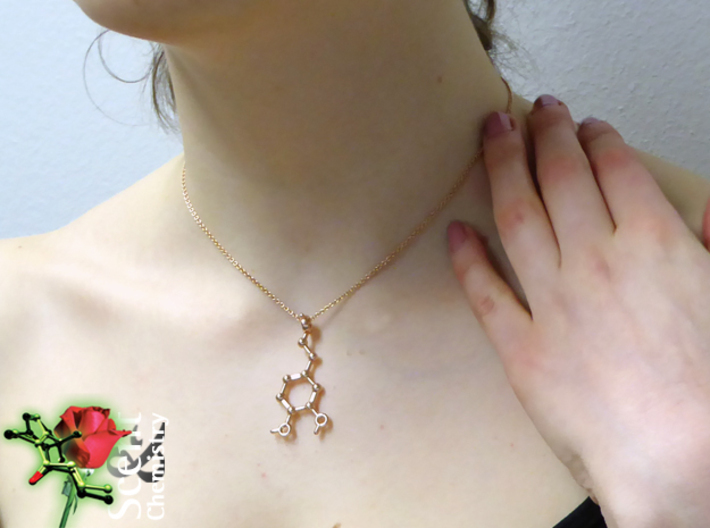 Dopamine [4-(2’-aminoethyl)pyrocatechol] like its fellow biogenic amine serotonin does not smell; yet, a lovely smell associated with a desirable person will definitely make your dopamine levels rise, galvanize you and make you fall in love. 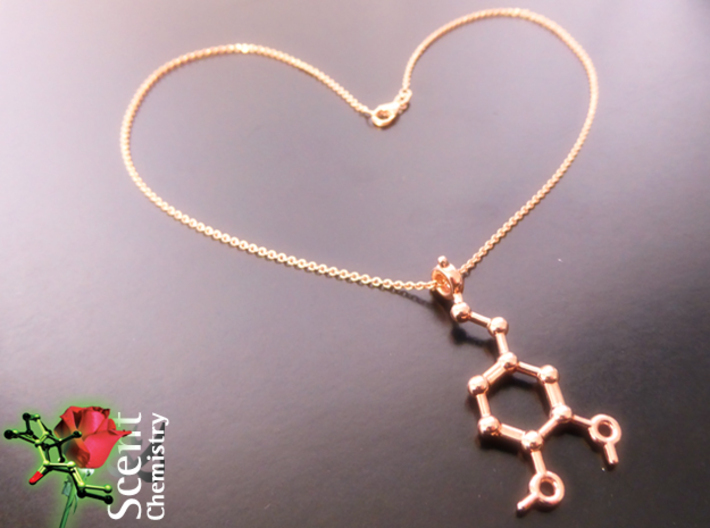 Thus, it comes as no surprise that the dopamine levels in the blood of newly found lovers are particularly high. 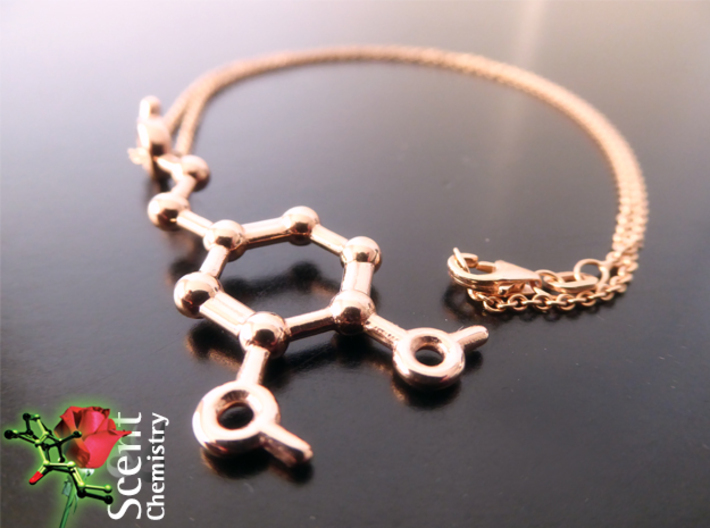 Not enough of this neurotransmitter and mood modulator, and you will become mentally confused or even schizophrenic, too much dopamine and you will become love-crazed and addicted against your own will. Yet, the right amount will induce a euphoric state of bliss. Lovers are in such a state of euphoria, at least when their love is young; everything seems possible, all obstacles can be overcome. The high level of dopamine responsible for this optimism and confidence also induces attention, which explains the exaggerated and elusive attention paid to one another. 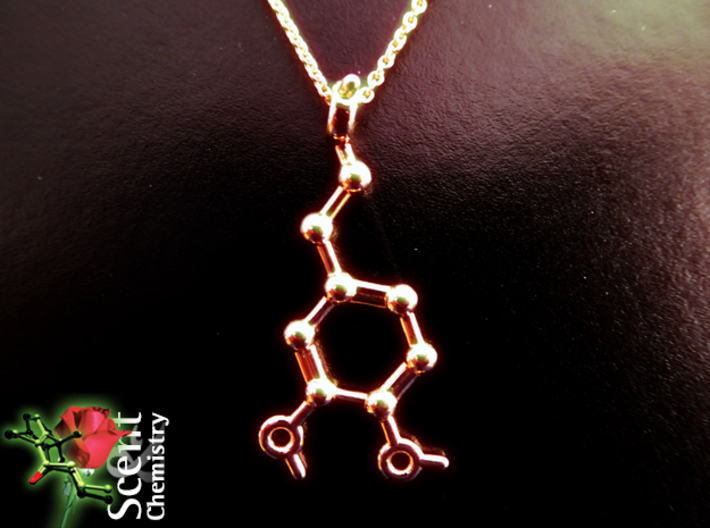 Dopamine rewards and mentally exalts, thus is highly addictive. Dopamine is biogenic dope! A dopalicious state is characterized by a high level of activity, an increase in energy, a lack of appetite and even insomnia. 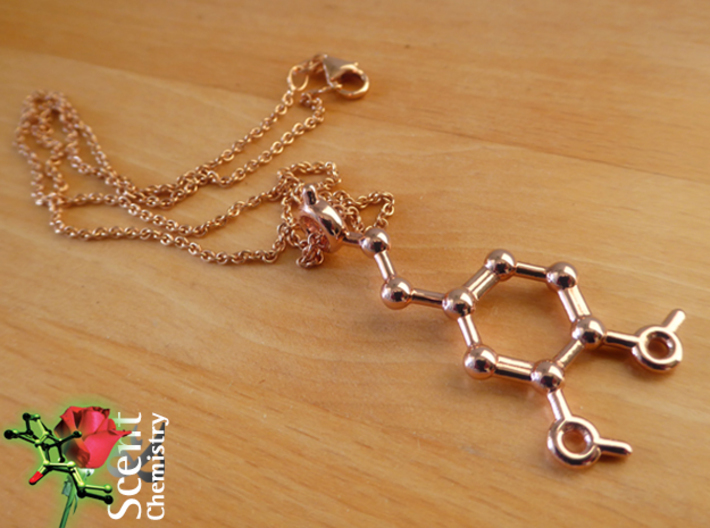 Dopamine is a molecular symbol of love with all its passion, excitement and euphoria. 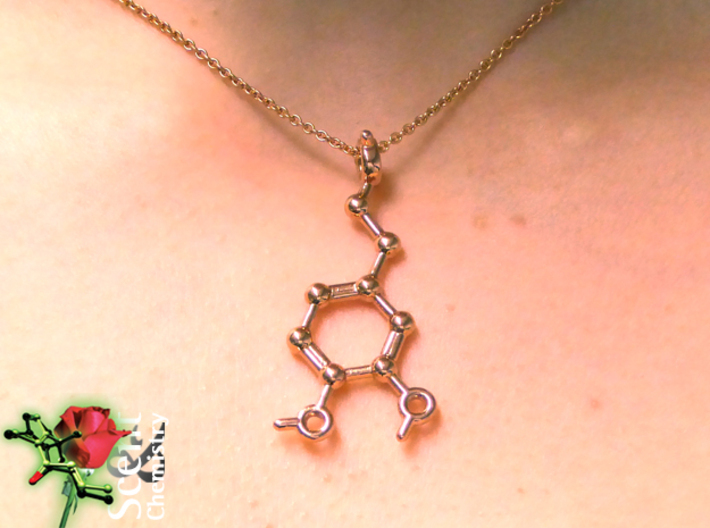 Dopamine is joie de vivre, vitality, soulfulness, joy and happiness in one simple molecule. 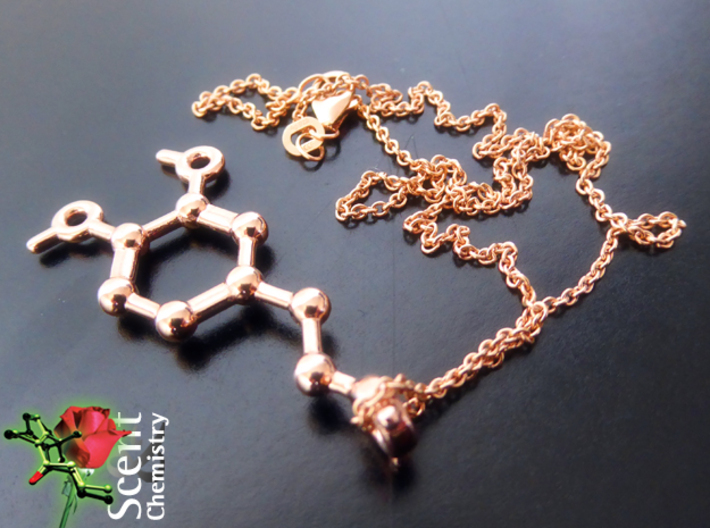 Where serotonin soothes and relaxes, dopamine will make you crave for more. 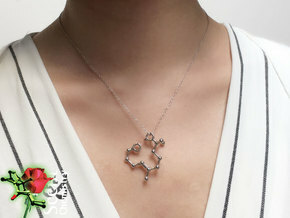 Dopamine generates desire, focuses attention, makes courageous and concentrated. 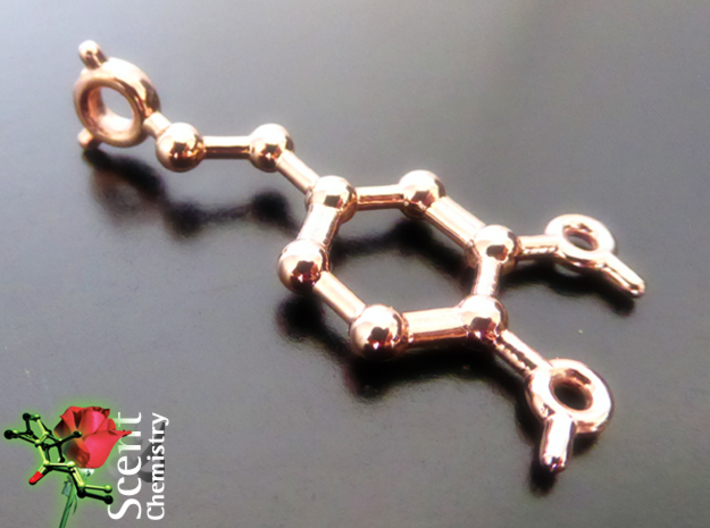 Dopamine is the universal endogenous pick-me-up. 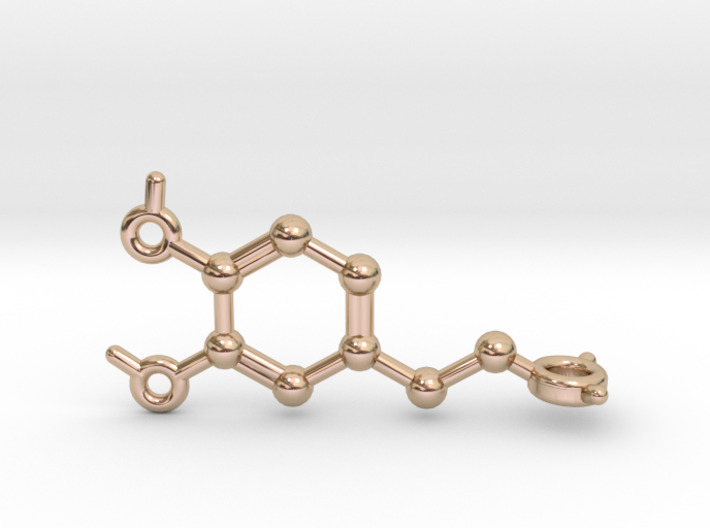 The dimensions of the dopamine pendant are ca. 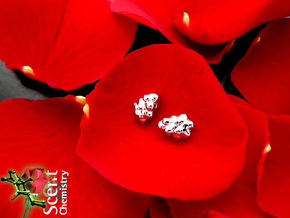 4.3 cm × 2.2 cm × 0.9 cm, and the hole for the necklace (not included) has a diameter of ca. 3.8 mm. It looks stunning on Oro Vivo gold and rose gold plate Sterling silver chains, such as Oro Vivo 7612690465149 – 738559113438.